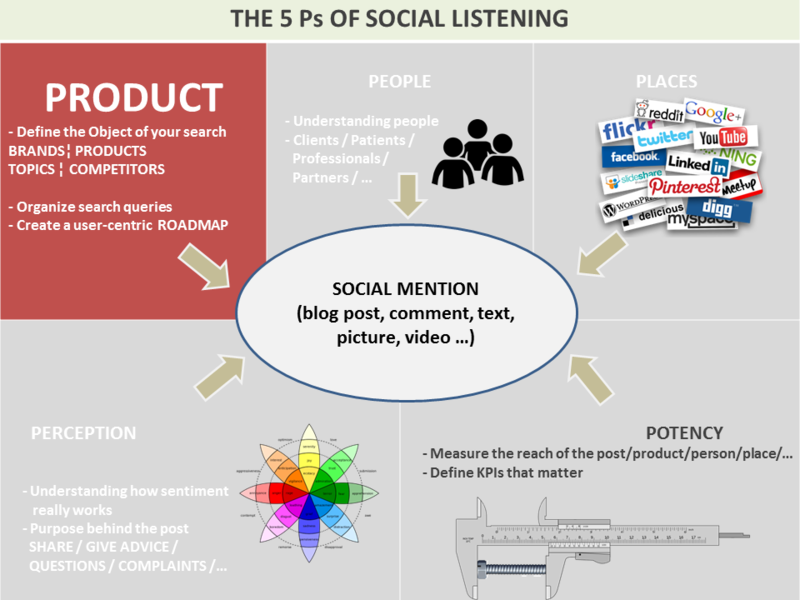 In my previous post I gave a high level idea of the 5 P’s of social listening. In the following posts I’ll delve into each of them (product, people, places, perception, potency) and describe what is at stake, as well as give some steps to use them to your advantage. I start here with the 1st property of a mention: PRODUCT. It’s not only the physical product of course, it’s the subject matter, the object of your “search query”. This first property is not very glamorous, quite tedious and you might be tempted to skip it, but this is the mandatory starting point, and of the utmost importance as this will siphon mentions into your dataset and will impact the quality of your analysis at the source as well as the structure of your listening activities. In Social Listening terms, Product is indeed the search queries you’ll need to accomplish your objectives. Defining this part right is like building the foundations of your listening strategy. In many cases this part is neglected, people jotting down a few keywords on a napkin. Basically, you can end up paying a lot for some glorified Google alerts and colorful charts. No social strategy is possible without adequate listening and measurement techniques, and failing in that part will confuse and frustrate you and your colleagues, and can put your company behind in a big way. The whole foundation of your listening could look like this. 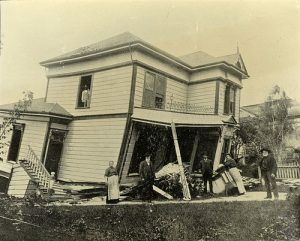 Of course there are corrective actions, but it almost always involves tearing down the existing structure to rebuild something completely new on top. 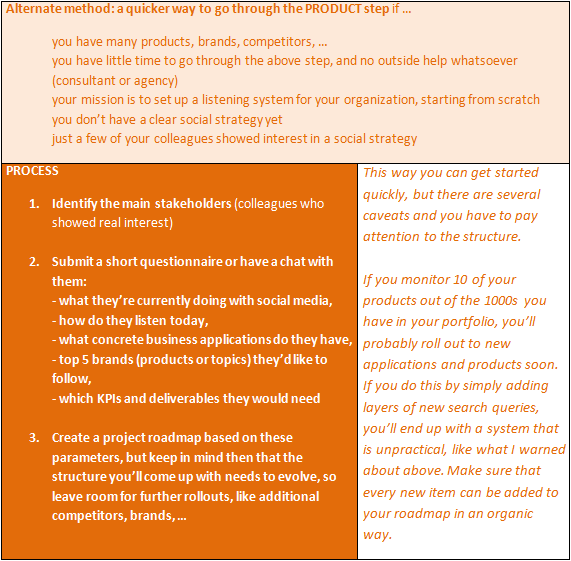 Until you go through these excruciatingly annoying steps, you’ll have to go back to that initial stage of defining the object of your listening strategy, fail and start again, until you spend the time necessary to figure this out. I propose a few steps below to get started in a sustainable way. I’m aware of the heavy task at hand, but once done, the fun part will really start when we move to the other P’s (or at least my vision of fun). You need to label things right, in a way that is comprehensive to everyone and compliant with your organization, everyone needs to understand what the search and segmentation elements are about. Barbaric acronyms: for departments, business functions, … if it’s the case, you need to keep a glossary somewhere, the acronym and the translation in plain English (or other language). This won’t challenge your brain cells much, it’s more the annoying part to dig for the information and consolidate it in a file. It’s time-consuming but you don’t need to do it all at once. The biggest obstacle to overcome is where to find the data. There are chances you don’t have all that information, which products, how many, … and cannot locate it. It may sound surprising to some, but this is very often the case within large organizations. If your company has a portfolio of 1000s of products, the best place to look may be the e-commerce department. They play around with that info on a daily basis and they should have a file somewhere. There are other places of course where this info should be kept, chances are that the finance department will have something. Market research should have something about the competition to help with this. It may feel awkward to raise hell to find these elements, people won’t know where to find it, will wonder why the hell would someone want all that info, won’t have time for it, will wonder who you are, … . But it’s unthinkable in this day and age of big data, that an employee in a company wouldn’t know where to find such resource: it must be stored in a unique place, easy to locate and known to each employee, constantly updated, with a clear taxonomy and naming convention, and exportable in multiple formats. This may take time, so don’t wait indefinitely, start today with what you have. The above example is for global brands working on several industries. Things can be simpler sometimes. You don’t have to follow the level of detail above if it’s too much. Use as you see fit, if you’re only manufacturing 5 models of bicycles, there will hardly be a need for one category even. So, to sum it up, there’s no unique paint by number model here. Use the values that are key to your industry, and your colleagues. That’s a tough one as you’ll be confronted to many possible options. A chair can be used in the living room, in the kitchen, in the bedroom, … And in the kitchen you’ll have a table, chairs, … What should be the top element in the tree structure? The product itself (type of object) or the usage (seating, including couches, bar stools, …), or the context (kitchen)? The tree structure is quite challenged here. Every colleague will give you a different version depending on their priorities, and none of the solutions will match everyone’s needs. The solution will be to use the “most common” taxonomy in the industry with a few branches in your tree structure, and create after that parallel tree structures. Well, we’ll come to that later. First things first, we need to understand what is possible with the current listening solutions, in terms of collecting and segmenting the data. When you use a listening solution, you’ll create search queries in order to catch all the content. In most cases, it will be keyword based. The search query will syphon in mentions. SEARCH QUERIES AND WHAT DO THEY CONTAIN? Boolean Search Query should be the most exact and precise way to define it. A search query contains 2 elements: KEYWORDS (the terms you’re searching for) and BOOLEAN OPERATORS (the links between these keywords, to look for exact strings of text, exclude irrelevant keywords, and many more options available). A search query is the search you type in Google for instance. You usually type a simple keyword (Galaxy), or a few words to refine the search with your intention (Galaxy Fire Hazard), or an exact expression (“my Samsung Galaxy caught dire”). Listening solutions provide for more sophisticated searches to refine the results, as broad as possible, yet excluding the noise. The most used operators are AND, OR, NOT (or AND NOT), but many other more sophisticated operators are available. This means you want to collect mentions that contain the words “Galaxy”, OR “Samsung”, but all of these mentions need to contain the word “fire”. After that, you want to exclude mentions containing “astronomy” OR “milky way”, that won’t be relevant to your search. The Boolean operators are pretty self-explanatory (yet with a sour taste of your math lessons back in school), yet search queries can become very complex, mostly when brackets are getting multiplied. I won’t elaborate on all operators available on the market just now, but the listening solution you’ll pick needs to have a maximum of operators, I’ll refer to a post in the future to delve more into semantics and operators. A search query is only as good as your intentions are clear. Do you want to capture the whole Apple universe, products and all topics included? (Apple OR mac OR macbook OR mcbook OR iphone OR …) NOT (fruit OR juice OR “adam and eve” OR snake OR …) well, very simplistic example, such a query would take much more artistry. PROS: one query for all purposes, imagining you find the perfect query (this one is really tough though), this will cut the cost of data by removing duplicates, give you a unique brand query, the whole universe of the brand in one go. CONS: even if all the data collected is relevant, your marketing teams will complain that all the corporate stuff is irrelevant to them, HR will complain that only 0,05 percent of mentions are relevant to them, customer service will spend many over hours looking at things that don’t concern them. So a general query is maybe not the solution. But I just said maybe, the segmentation part will help further. Then maybe you’d rather go for very specific querying? 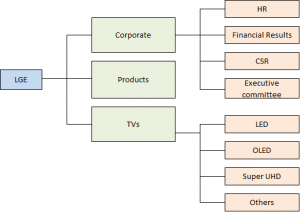 For each purpose, type of interaction, business function in the company? PROS: you’re very focused now, the mentions will be funneled to the right people in the support department. But wait, maybe devs would be interested as well if it’s a recurring problem. And why not corporate communication if it’s a very serious issue involving product recalls. CONS: I already hinted above at some limitations of such system. 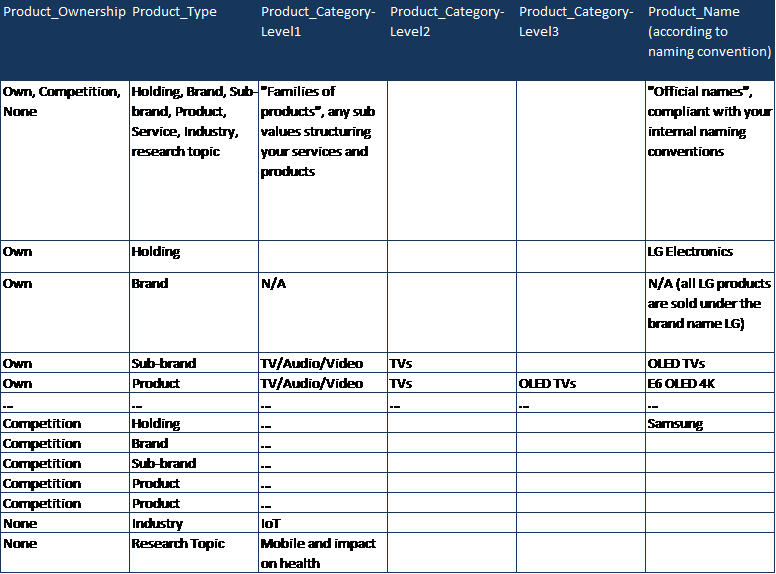 Also, creating a search query, one per product/issue/topic, … will create a lot of multipliers. Let’s take the example of a small brand with 10 product references, 1 brand name, 20 main topics (HR, financial info, sponsoring, CSR, 5 product features, issues, customer service, invoicing, …), 3 main competitors … after some dumbass combinatorics, we land with a potential amount of (11 X 25 X 3) = 825 search queries. Then come further multipliers about perception for instance, landing us 1000s of search queries for a SME. It’s just not possible. You can’t keep track of where is what, who needs the info, and people will be overwhelmed very quickly. Both systems above are quite extreme: the first model shows a general search query that won’t give you any level of detail, making the plethora of results useless, while the other allows for great level of details, but with so many search queries that you’re bound to spend all your resources creating and exploiting such a system, to very little effect. The idea is to come up with a more or less general search query, and slice it into specific topics, products, perception values, … in order to make sense of it. This way you can take advantage of the benefits of each system. In order to slice that data, you’ll need TAGS (segmentations on one level only) or segmentations on 2 or more sublevels if the listening provider allows it. To my knowledge, no listening solution offers this in a consistent way. There are solutions out there allowing to archive mentions into many sublevels, but this is just for archiving mentions and not playing around with that data in filters or charts, so with very limited business applications. I’m probably biased here having worked for Brandwatch for the past 5 years and believing that 2 sublevels of segmentation are actually enough. Less would be too limited, more would be too intricate for the common mortals. If you remember the example with the chairs and tables, the tree structure with many sublevels will be challenged, everyone in the organization having a different vision of the tree, from their own angle. 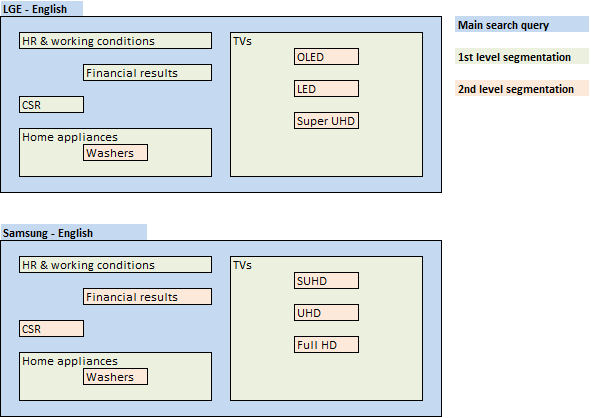 The above explanation about queries and tags – or other levels of segmentation – will be useful for this step. 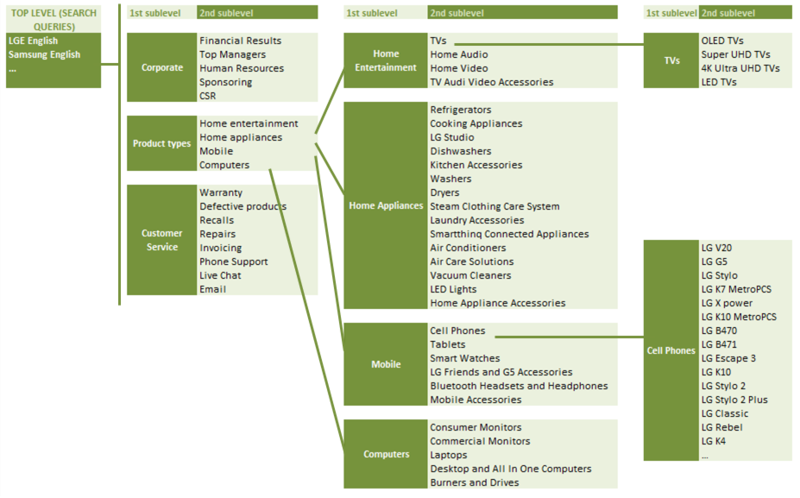 For now, you should end up with a crowded Excel file with all the fields you’re aware of, brands, products, services, competitors, … and a top level idea of what the tree structure will look like. As mentioned before, you should privilege a structure with 2 sublevels of categorization. This way you can group sub-elements in a more practical way, while limiting the complexity of a multi-levels structure. TOP LEVEL OF DATA COLLECTION: on the left, you have the general queries, the funnel that will the social data. 1st LEVEL OF SEGMENTATION: those are your main folders, so that you can group the topics in a comprehensive way. And that’s it. Since most listening systems won’t allow you further sublevels of segmentation, you’ll have to play around with that. We already have three levels, which is quite good: SEARCH QUERY, MAIN FOLDERS, and SUBFOLDERS for each main folder. The way I show it in the structure above mimics a tree structure, since I put the different items in different columns, but the reality is that we just have folders and subfolders. Working this way allows you to get a comprehensive structure, that can grow organically as you add more items. How to put mention in the proper segments? Well, this can be done manually, but obviously there can be easier ways. This will be done via search queries that will automate the process. There are two ways for that: the listening provider allows you to create Boolean sub-searches, or you’ll have to do it yourself, in all cases this needs to be automated as much as possible. Let’s look at a specific example. I got a huge commission at work and decided to invest in one of my pet projects, that I consider being one of the most important things in life, eating and cooking well. That goes with revamping my kitchen, and I post a lot about this. I got myself an LG “4.7 cu.ft. Capacity 30″ Built-in Single Wall Oven with Crisp Convection”, reference LWS3010ST. I inaugurated the new installation for thanksgiving and twitted a picture of the turkey: “Thanksgiving family reunion, Mary’s Free-Range Turkey, made extra crispy by my new LG convection oven”. I already mentioned LG, which is good for the community managers there, but I won’t give the exact product name or reference unless I have to complain about it. Will this mention reach the right people at the fine LGE organization? 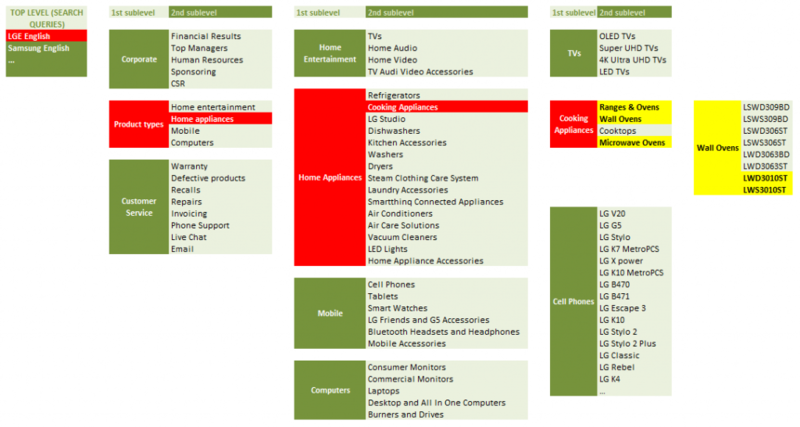 PRODUCT TYPE/HOME APPLIANCES: let’s say I created a good sub-query: (oven OR microwave OR … ), this will be sorted in the proper product type, so chances are that it’s getting much closer to the relevant people. COOKING APPLIANCES/WALL OVENS: well, that one LGE can’t possibly now from the message I posted. Convection ovens can be in the following categories: “Ranges and Ovens”, “Wall Ovens”, or “Microwave Ovens”. 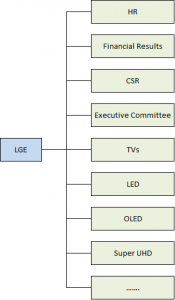 So this stops here, I bought an LG product, Product Type=Home Appliances, Home Appliances=Cooking Appliances, Cooking Appliances=”Ranges & Ovens”OR”Wall Ovens”OR”Microwave Ovens”. We won’t get to the final level, which is the exact product reference. Now we have to make sure that we have everything in place to collect and direct the mention to the appropriate people. You remember the initial query capturing the whole LGE universe in English. 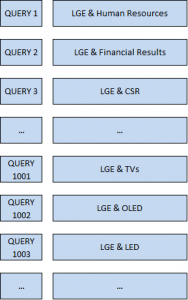 The same concept of Boolean search queries should be applied to each of the items in my segmentation structure. 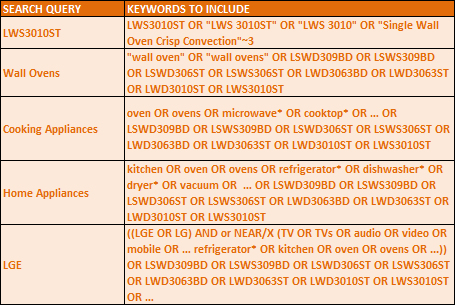 We start from the very specific, Wall Ovens / LWS3010ST, with keywords specific to the item in question. When we go to upper levels, we’ll need to include the keywords of the lower levels, like the reference number of a specific product. Imagine I post something mentioning only the reference number (for instance I’ve been very unspecific: “just bought a LWS3010ST, it doesn’t work, is there a repair shop near Phoenix?”). Unless the product reference number is in my initial search query, I’ll have no chance to view that mention. It is unlikely that someone will tweet without finding the right twitter handle, but better to be sure when creating your search queries. Please note that some people are specialized in crafting such search queries, your listening provider, or you can outsource it to some experts, you don’t need to do all the work yourself. Your main mission is to share a structure that makes sense. Your project roadmap, which is a well structured arrangement of all your elements, starting with the MAIN SEARCH QUERIES on the left side, then the segmentation items. Remember that you don’t need to go into great levels of details. For the wall ovens for instance, if you see there are only very few mentions and most of them can’t be traced to a unique product (like a convection oven that could be a wall oven or a microwave), do not spend time creating a complex structure, you can simply stop at the “kitchen appliances” level. Well, it was one long post. We still need to make the listening roadmap user-centric, make sure we listen to the right things, and that there are some people listening at the other end of the line, which is key since your colleagues need to act on this, budget and time resources are limited, so let’s make sure it’s money well spent and prioritize what can benefit our business. Still a couple of extra steps to come and will move to the more exciting PEOPLE section. And of course feel free to comment or ask for anything relevant to your business, we’re always glad to help.